Lake Arrowhead is located only one minute away from Arrowhead Tree Top Lodge. The lake and the surrounding has plenty to do for guests of all ages. 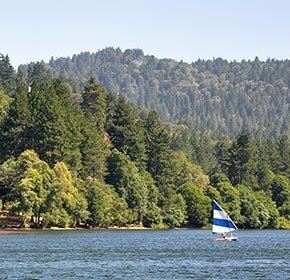 Lake Arrowhead is one of the premier resort locations on the West Coast offering stunning scenery, beautiful wildlife, high-end wining and dining, and activities including water sports, hiking, cycling and fishing. Read below to see the wealth of possibilities for adventure near our lodge. Experience the majesty of Lake Arrowhead on board the Lake Arrowhead Queen Charter Boat with a guided tour that will teach you the history of the lake and allow you to enjoy a unique perspective of the area. Purchase tickets in advance at Leroy's Boardhouse. Private charters are available. Reserve the board for birthday parties and other special events! Famous for the outlet store shopping, Lake Arrowhead Village offers festivals, concerts, and more! Find fresh treats at the Farmer's Market on Fridays throughout the summer season. 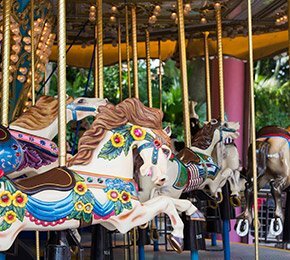 Ride the go-carts, bumper cars, and the carousel at Lollipop Park or move to the sounds of the summer concert series. 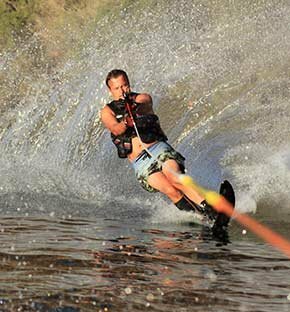 Take water-skiing or wakeboarding lessons at the McKenzie Water Ski School or experience fine food from Belgian Waffle Works or California Thai Cuisine. Play some games in the Family Fun Center. There's something for everyone at Lake Arrowhead Village! 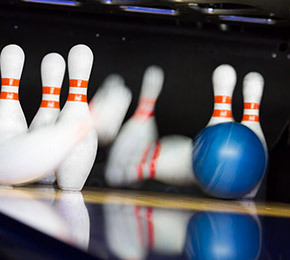 Rim Bowling Alley is a hot spot for bowling with a bar and Giuseppe's Italian Pizzeria restaurant and a Subway restaurant inside, located in Crestline, California. Fun for everyone with bowling, video games and food! Lake Arrowhead enjoys good weather for much of the year but for the colder nights or just a change of scenery, the Blue Jay Cinema, about a mile from the lake, shows the latest movies in a restored theater. 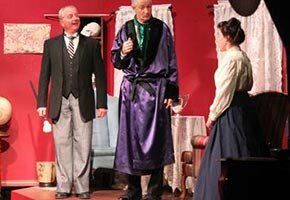 Located on the former site of Bugsy Segal's Historic Speakeasy and Mountain Hide-away, the building is now a Dinner Theater and Entertainment venue for the Lake Arrowhead Repertory Theater Company. Catch a live show year-round or listen to music while enjoying burgers and brews at Tudor House Entertainment on many Wednesdays and Saturdays. Wildhaven Ranch is a wildlife sanctuary and educational facility that is open to the public at 1:00 p.m. on Wednesdays, Fridays, and Saturdays by reservation only. 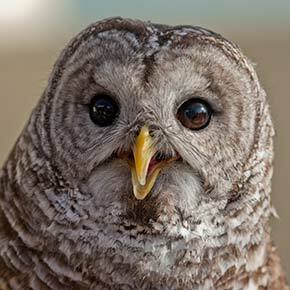 They provide a protective environment where non-releasable wild animals can live out their lives in safety and peace. Visit the ranch for an up-close and personal experience with animals like bears, bobcats, raccoons, falcons, eagles, hawks, and owls. They are located off Hood Creek Road in Cedar Glen. Please call (909) 337-7389. Visits & Tours must be scheduled in advance. 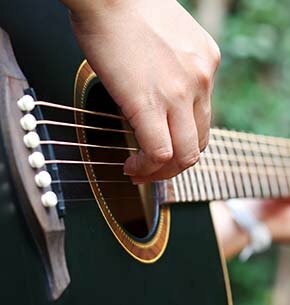 Located in Lake Arrowhead Village, the Summer Concert Series is free to the public. Concerts usually begin at 6:30pm and the beer garden opens 30 minutes prior to the concert start time. For more information, call (909) 337-2533 M-F, 9am-5pm. The Mountain Skies Astronomical Society is open 11 am - 2 pm on Fridays & Saturdays for star gazing in the Robert Brownlee Observatory. They have an amazing telescope and tours are welcome. They also have a fun gift shop where you can purchase collectable space items. Step back in time to the early days of colorful Indian villages, massive lumber mills, famous movie stars and their films. Walk through the Santa’s Village display and Cozad movie theatre. The Rim of the World Historical Society Museum is open June through October and Saturdays and Sundays from 11AM to 5PM. 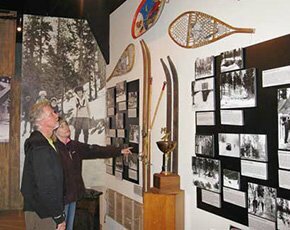 Come by and enjoy the collections and displays of the fascinating history of the San Bernardino mountains. Call 909-336-6666 for more information. 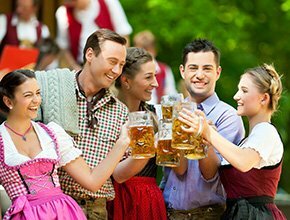 Featuring the more authentic German and craft brews than any other Oktoberfest in Southern California, you won't want to miss the annual Oktoberfest in Lake Arrowhead Village. Held from September through October, admission is free and the German food is terrific. You can also enjoy seeing a special German car display and listening to live music. Hiking trails in the area combine gentle lakeside walks with scenic and more strenuous excursions into the San Bernardino Mountains. 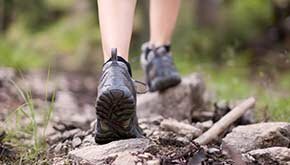 There are routes for novice walkers through to challenging trails for experience hikers. The Pacific Crest National Scenic Trail cuts through the area while many other visitors take in trails around the Deep Creek Hot Springs in the mountains. Water skiing is permitted on Lake Arrowhead and summer months in particular see water skiers and boogie boarders enjoying the water. You might catch a glimpse of high speed races from the shore or you can get in touch with the Mckenzie Water Ski School either as an experiences skier to hire equipment or as a beginner to take a few lessons. The season runs from May through December and the family-run school offers a warm welcome to visitors to the area. 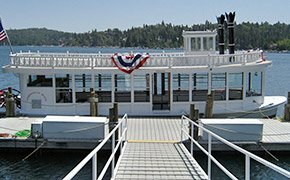 Another popular activity on Lake Arrowhead itself is the Arrowhead Queen Lake Tour. The excursion round the lake by paddleboat takes about an hour and allows you to view some of the beautiful homes built overlooking the lake. The fishing on Lake Arrowhead has never been better. Our guests have access to the private beach for sun-bathing or fishing. 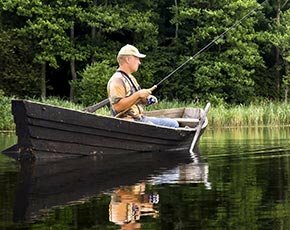 Large Mouth Bass, German Brown Trout, Crappie, and Bluegill can all be found in Lake Arrowhead. Rainbow Trout are planted in the lake annually. Although Lake Arrowhead is a private lake, State fishing regulations apply and state fishing licenses are required. Lake Arrowhead isn’t the only lake in the area worth visiting. Lake Gregory County Regional Park is well worth an excursion if you are in the area. It allows visitors to fish from the shore and also has facilities for hiking, swimming and picnicking. A good way to explore the park is via the Easy Lakeview Trail which loops around the lake and takes in beaches, woodland, small creeks and mountain views. There are fitness stations along the way or benches for the less active and plenty of tables and recycle bins to allow walkers to eat and then tidy up after themselves. Other activities found in the park include waterslides, cycle rental, basketball, kayaking and sand volleyball. Snow Valley Ski Resort is a short drive from Arrowhead Tree Top Lodge with great runs and instructors if you need to learn. From kids to adults, Snow Valley is a fun way to spend the day during winter. Every Sunday at Deer Meadow Grille (weather permitting) from 12:00 - 3:00, live bands will be playing . Enjoy a burger and a beer while listening to some of your favorite songs. Woody’s Boathouse Restaurant serves good food located right on the waterfront at Lake Arrowhead. They offer a casual, friendly, and inviting atmosphere. The restaurant seats over 200 with lake views from every table. A beautiful patio is also available. 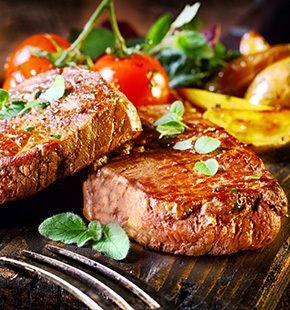 Woody’s menu offers a wide selection of steaks, pasta, pizza, sandwiches, and many fresh fish and seafood selections. 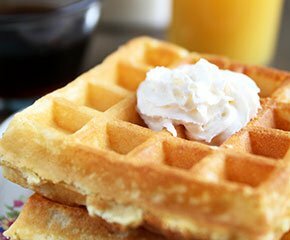 The Sunday brunch is a popular feast with the omelet and waffle bar along with barbeque meats and a giant boatload of salads and a large selection of homemade desserts. Call (909) 337-2628 for more information. 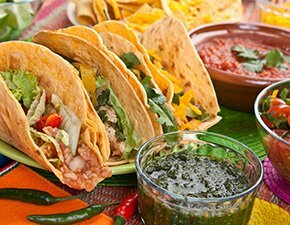 Featuring live music and an outdoor patio, Papagayos Mexican Restaurant serves delicious food and has a fun atmosphere. They also serve breakfast on Saturdays, Sundays, and holidays. Each year after Labor Day they switch from Patio Tacos to the German favorites, Bratwurst, Knockwurst, and Polish sausage for the festival known as Oktoberfest! Call (909) 337-9529 for more info. 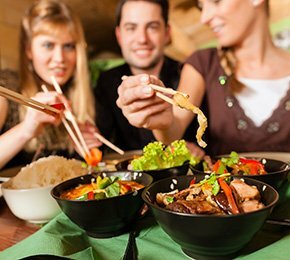 Every Friday and Saturday are dancing nights at California Thai Cuisine and happy hour is Monday through Friday 3PM tp 6PM in the night club. Wednesdays are karoake night and Thursdays feature live bands. Featuring a full sushi bar and Monday through Friday lunch specials, there is something for everyone - even delectable desserts like fried bananas and sticky rice with mango. Call (909) 337-0111 for more information. Belgian Waffle Works is a family-owned restaurant located dockside in the Lake Arrowhead Village. Their extensive menu includes 17 specialty waffles and other dishes like pulled pork sandwiches, salmon, angus beef, and vegetarian patty sliders on a brioche bun. Reservations are available for parties of six or more and can be made by calling (909) 337-5222. Reservations are not available on holidays.